Clear, dry and dynamic PAF tone. Both the neck and bridge pickup offer the classic dry-woody tone. Very musical, clear and dynamic. These have that legendary front-of-the-note PAF attack and bloom and bite. 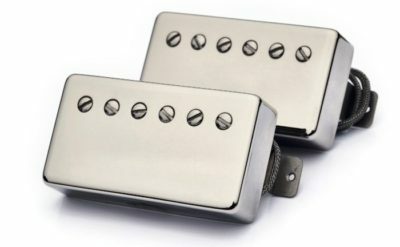 Neck and bridge pickups have roughcast ALNICO 4 magnets. Magnets are charged individually to very specific levels matching vintage PAF magnets that have been tested for killer sound, balance and dynamics. 7.4K neck and 7.6K bridge.